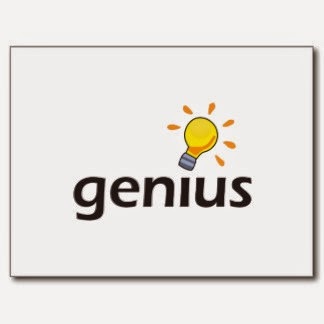 Are you a GENIUS? - Something New Everyday! Home wisdom Are you a GENIUS? 2. Four men can build four boats in four days. How long will it take one man to build one boat? 3. Test your memory on this passage: Three men and their wives and a widower left by car at noon one day for a picnic. After they had gone three miles, they saw two men and a child in another car that had broken down. ‘That is tough luck,’ said one of the picnickers. At 1 pm they arrived at the picnic grounds, where they saw only the old one-armed caretaker and his son. They immediately started to eat their luncheon of sandwiches, fruit and cake. Question: How many people have been mentioned? 4. Which is heavier, milk or cream? 5. What one word means both ‘dodge’ and ‘immerse’? 6. Rearrange the letters in the word ‘sleuth’ to make another word. 7. What word meaning ‘ship’ would mean ‘small collections of water’ if the letters were read backwards? 8. If a clock is stopped for a minute every ten minutes, how long will it take the minute hand to complete a revolution? 9. What adjective which means ‘pertaining to citizenship’ spells the same from right to left as it does from left to right? 11. There is a monosyllable which, if you add to it a single letter, becomes a word of three syllables. What is it? 12. A man lived in a house that could be entered by only one door and five windows. Making certain that there was no one in the house one day, he went out for the afternoon. Upon his return, although the windows were still locked and unbroken and the door had not been forced, he discovered a thief in his house robbing it. If the thief did not use a skeleton key, or pick any of the locks, how did he get into the house? 13. If a hen and a half lays an egg and a half in a day and a half, how many eggs will seven hens lay in six days? 14. The first two syllables of the name of one of the States of the United States is suggested by a girl’s name. The third syllable is suggested by a word meaning ‘debark’. What is the name of the State? 15. How will the following sentence, attributed to Napoleon, read if you start with the last word and read all the letters and words backwards? ‘Able was I ere I saw Elba.’ If a clock is stopped for a minute every ten minutes, how long will it take the minute hand to complete a revolution? 18. My father is the brother of your sister. What relative am I of yours? Cousin, nephew, son, uncle, son-in-law? 19. By eliminating one letter in each of four words in the following sentence, a new sentence of an entirely different meaning will remain. They heard meat was stewed. 20. What two four-letter words pronounced the same but spelled differently mean ‘valley’ and ‘curtain’? 23. The first part of the name of a certain make of American car is suggested by a word meaning ‘call’; the second, by a word meaning ‘insinuation’. What is the make of the car? 24. There were three horses running in a race. Their names were Tally-ho, Sonny Boy, and Juanita. Their owners were Mr Lewis, Mr Bailey and Mr Smith, although not necessarily in that sequence. Tally-ho unfortunately broke his ankle at the start of the race. Mr Smith owned a brown and white three-year old. Sonny Boy had previous winnings of £20,000. Mr Bailey lost heavily although his horse almost won. The horse that won was black. This race was the first race that the horse owned by Mr Lewis had run. 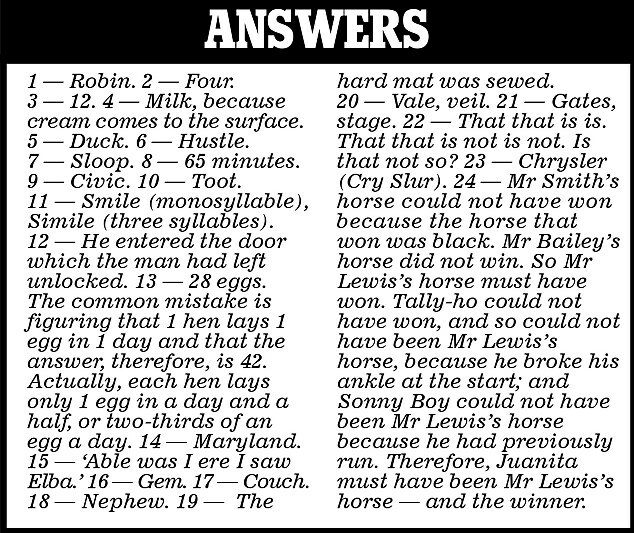 What was the name of the horse that won? Extract from Are You Really A Genius? Timely Tests For The Irritatingly Intelligent, by Robert A. Streeter and Robert G. Hoehn.